​Manchester City eased past Cardiff City as the champions returned to the Premier League summit. The hosts began the evening two points behind Liverpool but leapfrogged them courtesy of first-half scores from Kevin De Bruyne and Leroy Sane. They were rarely threatened and saw out a comfortable victory against the strugglers, De Bruyne's early finish setting them on course for a routine win before Sane drove a low shot beyond Neil Etheridge with the break looming. The Bluebirds remain in 18th position in the league, five points off of safety. They offered almost nothing going forward at the Etihad Stadium, though their measly 21% possession afforded them little opportunity to get at their hosts. Pep Guardiola's evening was slightly soured by the loss of Oleksandr Zinchenko to a suspected hamstring injury early on in the contest. The defender - who won the club's February Player of the Month award - will be sorely missed having developed into an accomplished full-back, with counterpart Benjamin Mendy's continued absence compounding the issue. Here's a breakdown of the encounter. It was far from a vintage ​City performance, but once again the team did what was required. Victories such as this, as well as the narrow wins against ​Bournemouth and ​West Ham United in recent weeks, are just as important as heavyweight clashes with the likes of ​Liverpool. 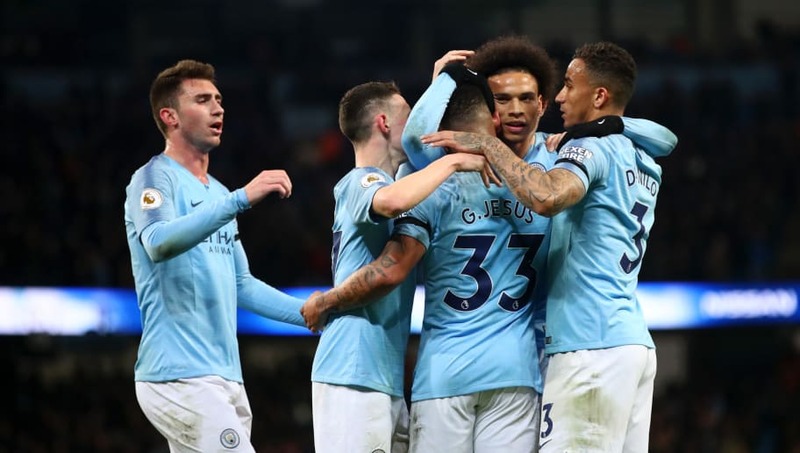 Eking out results when not at their fluent best is a worrying sign for their rivals, suggesting that City will not drop many points as they push for back-to-back ​Premier League trophies. It is also worth noting that this was far from Guardiola's first-choice lineup, the strength in depth at the Etihad Stadium allowing them to rest key personnel. Kevin De Bruyne has scored his first Premier League goal since the 22nd December 2018 vs. Crystal Palace. This was a match that once again demonstrated the hosts' ability to compete on multiple fronts as they pursue an unprecedented quadruple. When they can call upon youngsters such as Phil Foden and fringe players like Riyad Mahrez to get the job done it makes the prospect of City completing that remarkable feat not so far fetched. Starting XI - Ederson (5), Danilo (7), Stones (6), Laporte (8), Zinchenko (5), Fernandinho (7), de Bruyne (8*), Foden (8), Mahrez (5), Jesus (6), Sane (7). The 27-year-old has had his season curtailed by injury problems but looked in the mood and on the money tonight. ​Bluebirds players couldn't lay a hand on him as he dictated the play, linking wonderfully well with teammates. His sixth minute lifted effort eased any fears of another frustrating night for his side, goalkeeper Etheridge being left bamboozled by De Bruyne's ingenious finish. The ball cannoned into the roof of the net from a tight angle, showcasing the Belgian's brilliant footballing brain. Cardiff have a short spell of possession ended when their player simply falls over attempting to turn and dribble up the pitch. Good times. Neil Warnock's men are in desperate need of points as the season comes to a close, tonight's defeat leaving them with significant ground to make up on ​Burnley and ​Southampton above. It was disheartening to see City claim the victory at a canter, with ​Cardiff rarely looking like getting into the opposition box, let alone getting on the scoresheet. However, this is not the game that defines their season and is certainly not the match that relegates them. The home side's dominance is a reflection of the cavernous gap in quality between the elite clubs of England and the rest; the Bluebirds were invariably going to struggle to cause problems against a supremely confident City outfit. With that being the case, the visitors will not be too down over the result. They are aware that time is running out in their battle against relegation, but upcoming fixtures against the Clarets, ​Fulham and ​Brighton are more likely to bare fruit. Starting XI - Etheridge (7*), Peltier (4), Morrison (6), Manga (4), Bennett (5), Gunnarsson (6), Hoilett (5), Camarasa (5), Ralls (6), Murphy (5), Niasse (5). Substitutes - Reid (5), Bacuna (5), Mendez-Laing (5). The goalkeeper had shots raining in on him throughout the night and was consistently up to the task. Of course, he was unable to deny the champions on every occasion, but made the scoreline decidedly less embarrassing for his team that it may have been. The Filipino produced a string of immaculate stops as his goal was peppered by Manchester City shots. Two of his finest both came against Foden, the keeper managing to prevent the teenager's beautiful long-range efforts. Cardiff travel to Turf Moor in a vital clash in the battle to avoid the drop. A win would take them to within touching distance of their opponents and would undoubtedly improve team morale at a crucial stage in the campaign. Manchester City have a date with Brighton at Wembley this Saturday to determine who progresses to the FA Cup final. Their next outing in the league sees them make the trip to ​Crystal Palace, victory being a necessity if they hope to retain the title.